My Design Agendas work started off by looking at Ettore Sottsass who, as it turns out, was a very confusing character and quite difficult to define. He began his career as an architect, studying in Vienna, with a focus on modernism but ended up becoming a figurehead of the anti-design port-modernist movement. Sottsass himself disliked being pigeonholed into a style (despite being a founding member of Memphis, which seemed to be the pinnacle of post-modern design), and often talked about his fondness for modernism and how post-modernism wasn't always a send-up of the turn-of-the-century utilitarian design, but how it was more of a reaction to the rules set out by governmental design boards on "good design". Ok, so I still don't like the work he produced, but at least now I can appreciate where he was coming from. His sentiments also echo my own; though I love the sleek, functional aesthetic of modernism, I think it would feel oppressive to live with only those objects, their bleak and spare designs devoid of joy and personality. The designs produced after the post-modernism movement gave us a much more playful aesthetic, allowing designers to be flippant and have fun with their designs without them having to have some deep and meaningful core message. Yes, this gave us the mass-produced plastic dross that we throw away by the tonne but it also gives us pieces to enjoy just because we like them - Alessi's plastic range - without anyone trying to tell us that it isn't "good design". 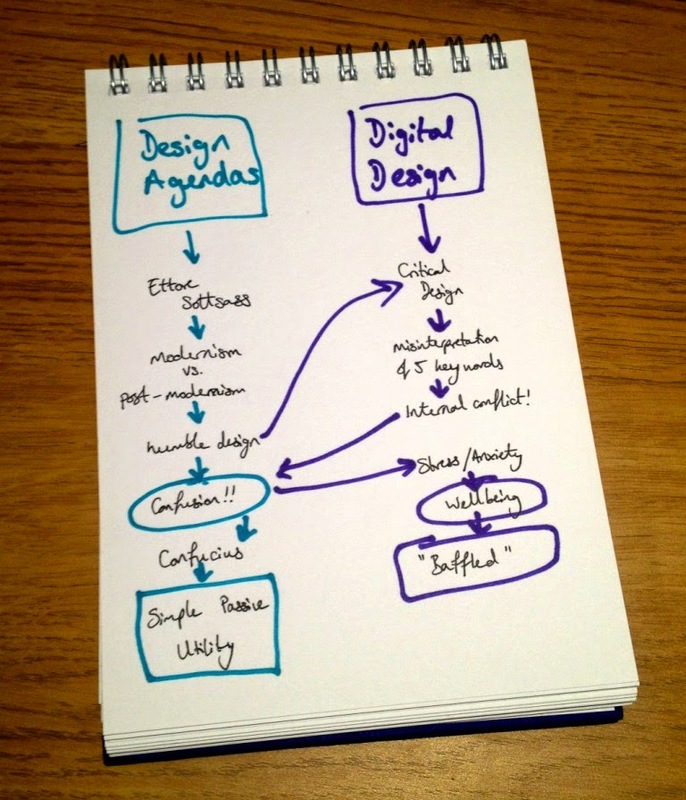 So then I spent a lot of time thinking about the celerity culture around design. Being a sentimental type, I think back on William Morris's ethos that everyone should be able to afford stylish items (of course in practice, his hand-crafted items ended up being well out of the reach of the layman). My mind then goes to the "big name" designers; Ron Arad, Zaha Hadid, Jonathan Ives, Philippe Stark etc. I have to say that regardless of whether I like specific designs or not, the overwhelming factor for me is the vulgarity of the celebrity designer. That's not to say that I'm pro anonimity in design, but it bothers me that many people think that these designers have the Midas touch. Out of this internal rant, I came to the conclusion that one of my design agendas should be to keep my designs humble. At the same time as all this internal dialogue is going on, I had to think of a product to design and prototype for my digital design module... Not surprisingly, this took a very long time to do. Looking back on it,I can see a direct path between my thoughts but when you're in the midst of it, it's a lot less clear. It started on an internal debate about whether I could create a deliberately obnoxious design - I was thinking of a speaker that would shout out tweets or facebook status' out loud to make people realise the things they say on the internet. Oh and it should have the voice of John Cooper Clarke. Quickly my brilliant idea became less brilliant as I realised that I don't have it in me to produce a design for something so obtuse and keep it going for a few months until the delivery date. I just couldn't get fired up by anything. During this time, we also had to come up with 5 key words that would help us focus our design intentions. Again, I think this probably says more about my own state-of-mind at the time than anything else and were widely misinterpreted, so were probably too tenuous. My words were: Gender Neutral, Dystopian, Joyful, Reclaimed and Natural. About this time in both the projects I really started to have some personal motivational problems, surrounded by the confusion in my own thoughts and the stress from knowing that I had to come up with something. I consoled myself with the saying "if it was easy, it wouldn't be worth doing". My own personal crisis led me to look at the topic of wellbeing. I once heard that 80% of students at university suffer from a mental illness during their university life, so even if I designed something that I could use to reduce my anxieties, maybe it would be useful for others too? This led me to a quote from Confucius, "Life is simple, but we insist on making it more complicated".